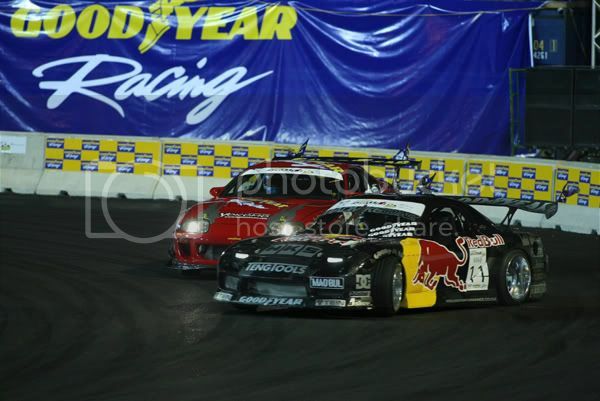 The inaugural Formula Drift Thailand, presented by Goodyear, ended with a climactic battle as “Mad Mike” Whiddett, New Zealand’s champion drifter, and 2004 D1 Japan Grand Prix winner Ryuji Miki competed head to head in a final showdown last weekend. Ultimately, Mad Mike was declared the winner after a heart-stopping three-round battle. Third place honors went to Malaysian drifter Tengku Djan, who was the 2009 Formula Drift Singapore champion last July. “Mad Mike” Whiddett, drifting with Goodyear Eagle F1 Asymmetric tires, overcame an equally gruelling knockout round with Tengku Djan in wet weather conditions as the rain poured before the Final Four began. Thailand’s first and only world-class drifting ground, Wonderworld Park, Ramindra, was filled to capacity as drift fans flowed in to pack the racing ground during the two-day competition. The 7,000 strong venue was fully booked. Intensity mounted on the second day when 32 qualifiers, including 23 Thai competitors, demonstrated their skills and techniques on the smoke-filled racing track, accompanied by the roar of powerful engines as the drifters revved up. The three American judges invited from Formula Drift lent an air of stringency to the proceedings as the organizers aimed to bring Formula Drift Thailand standards to a new, more professional level. 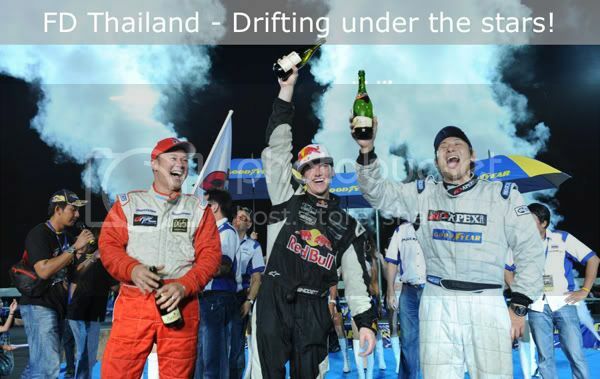 Thai drift king – Kiki Nana – was among the qualifying drifters and successfully sailed through to the final eight before being defeated and exiting from the competition. All Thai drifters taking part mentioned that this was the most impressive drift competition they had been involved in, and even though they were unable to bring the trophy home, the two days on the drifting ground with super drifters from across the region was an amazing experience. They also noted that they find international competing standards tough but very challenging. The two drifters from New Zealand and Japan sweated it out in the final battle. Instead of two rounds of battle like the other competitions, the two drifters had to compete in three rounds since their skills were highly matched. Judges were put in the hot seat as they just could not agree on an unanimous winner. It was decided that the competition would be settled in a third round of battle. Finally, it appeared that the third round had done the trick. Whiddett and Miki stood side by side on the stage. Tension rose to a peak as the third judge revealed his final score for Whiddett, and broke in a wave of emotion as the New Zealand drift hero was crowned the winner of Formula Drift Thailand with 2:1 score. The crowd went wild, cheering and clapping. After the trophy presentation, the winners had to stay on stage for more than half an hour as drift fans kept coming onstage to congratulate them in person. The organizers also kept the crowd entertained with stunt shows and highly energizing percussion numbers. Formula Drift now moves to Malaysia as Goodyear hosts the final competition in the ASEAN drift series, to be held in December 19-20 at the MAEPS (Malaysian Agro Exposition Park Serdang) grounds.